Chelsea vs. Queens Park Rangers : 29 April 2012. I had been floating on clouds – or possibly way above the clouds – since Barcelona on Tuesday. It was now time to reconvene back at The Headquarters for the more prosaic game against our local neighbours and irritants Queens Park Rangers. I will waste no time in trying to excuse my lack of relative enthusiasm for this match; no amount of self-imposed hype would manage to lift this game up in my estimations. After Tottenham at Wembley and then a double dose of Barca Fever, this was decidedly hum drum. For the second time this season, in fact, an encounter with QPR was making me feel a little anxious. I wasn’t concerned about our performance on the pitch. I was more concerned about the actions of a small but noisy fragment of our support who might – I did not doubt – spoil the day with some chants (well, one in particular) aimed at Anton Ferdinand. I was hoping that our supporters would replicate the fine show of wholesome support for the team which we witnessed in the FA Cup game at Loftus Road. No silliness. No ammunition for the massed ranks of the Chelsea haters in the media to have a pop at us. I was hopeful. Or at least until I remembered the nasty shouts made by some of our supporters at Wembley during the Hillsborough silence. I just hoped for our fans to show true support not only for the club but for John Terry, too. But without any bile or unpleasantness. Throughout this season – and if I am truthful, before it began – I have sensed that this might be a season in which I might develop a different relationship with my club. I’m not sure why. Maybe the new manager. Maybe a season of treading water. Maybe a season in which my support might be tested. Maybe even a year in which I lose that desire. As much as these match reports have been a record of Chelsea’s successes and failures on the pitch this season, they have also possibly tried to demonstrate how sometimes my strength of support and feeling for the club has sometimes varied. I’ve also tried to think more objectively about what I get out of the match day experience. I’ve tried to push my boundaries. I’ve constantly asked questions of myself. I’ve stuck with it this season. It hasn’t always been easy. I’ve made mistakes along the way; maybe I came down on the wrong side of the AVB debate. Maybe I should have trusted the club more. Maybe I should have trusted the club less. Throughout it all, I’ve almost been expecting a cataclysmic event which might prompt me to take a step back and take a long look at it all; the obsession, the craziness, the support, the whole nine yards. Well, I needn’t have worried. The early season promise under AVB gave me hope. The CPO share offer galvanised our support and made me so proud to be a Chelsea supporter. I stuck with AVB and tried my very best to support him. I even tried to understand the forces at work within the camp which lead to a players’ revolt. It has been a crazy season but I’ve stuck with it. And here we all are everyone. We are gasping from an incredible two week period, the like of which our football club has rarely seen before. Not only is this changing Chelsea team heading to Wembley for our fourth FA Cup Final in six seasons, but we are also heading to Munich for our second Champions League Final in five years. The whirlwind hour involved three pints of Peroni and a typically frantic period spent chatting to various mates. I chatted to Mike and Frank – my partners on that merry pre-match on Tuesday in Barcelona – and also several other NYBs. Some old friends, some new friends. Things were so rushed. It wasn’t as enjoyable as I had hoped due to the time constraints. I chatted briefly to my mates in The Bing and Munich was the centre of attention. Tell me if I am boring you. A few mates wryly commented that “we’re playing in the Cup Final in six days and yet everyone is talking about Munich.” In our parlance, there is still only one cup final that can rightly be called “the” Cup Final. Alas, one friend was notable by his absence. On Saturday, Jesus had travelled back to his home on the Mexico / US border and he will be missed. He has enjoyed the time of his young life these past three months and I only wish he could have found a way to stay – and get tickets – for the two finals. I spoke to him on Friday and we planned to meet up at some juncture on the impending US Tour. I left Parky at the bar to order “one last pint” and departed for The Bridge. The drizzle had continued but my main concern was getting in on time. 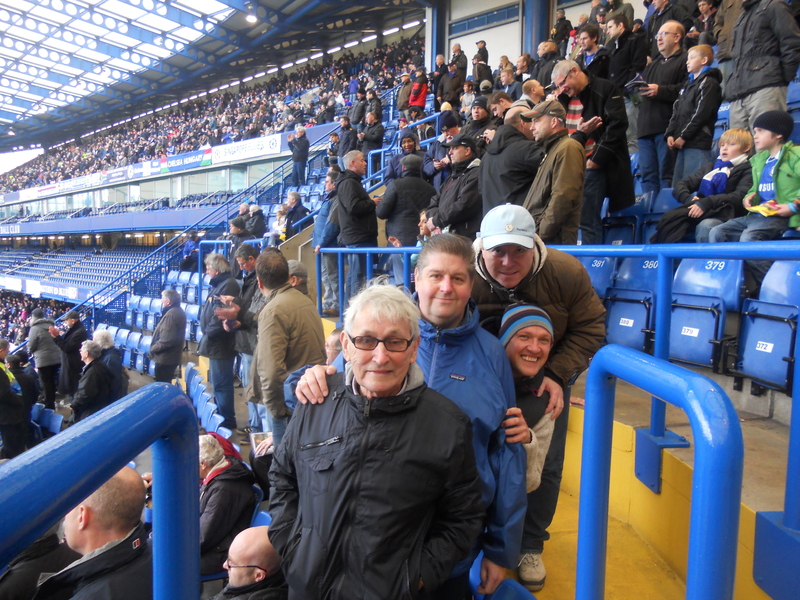 At the bottom of the steps for the Matthew Harding Stand, the supporters were faced with a wait. Drat. My watch was ticking. We had heard the last strains of “The Liquidator” and we then fell silent in the knowledge that we had missed the kick-off. It doesn’t happen very often. Then, a roar out of nowhere and it was obvious that a goal had been scored. The noise, though, seemed relatively subdued and we all wondered if – horror! – the away fans were the ones celebrating. By the time I had reached my seat, I had heard the name “Sturridge” mentioned a few times and so I could relax. Phew. Glenn was sat next to Alan and me again for the first time in ages and it felt right. I was keen to ask Alan if there had been any nonsense from Chelsea fans in the pre-game routines involving Anton Ferdinand. Thankfully, apart from a few schoolboy jeers, there was no racist stuff – implied or otherwise. Alan did say, though, that dear Anton made a point of jogging down to our corner and gesturing to the crowd. I guessed this was done to get a reaction, but nothing untoward apparently happened. What then happened in that first half just typified our incredible self-confidence and joie de vivre at the present time. There had been talk in the pub of the derby with QPR being a massive let-down; the phrase “after the Lord Mayor’s Show” was used more than once. We couldn’t have been more wrong. What a goal fest in the rain. Fernando Torres loves the rain in April doesn’t he? He loves getting his socks grey with mud, he loves the puddles and he loves plundering goals against soon-to-be-relegated London rivals. But first, a John Terry header, close in from a corner. John doesn’t miss from there. As he celebrated, running calmly towards us in the corner, he patted his chest and gestured to the adoring fans. I first took this to mean “calm down, don’t let the Anton Ferdinand stuff take over here” but it could just as easily have meant “so sorry for Barcelona – I can’t smile when I know I have let you down.” Maybe it was a mixture of the two. And then, the Fernando Torres Show. I was chatting to Alan about Munich (…sorry) during the sweet build up to our third goal. A sublime pass from Sturridge found an on-rushing Nando who adeptly rounded Paddy Kenny and slid the ball home. It was a super move and the crowd were in heaven. Soon after, an almighty faux-pas from Kenny presented Torres with a guilt-edged chance to score again. With a natural extension of his right leg, he whipped the ball into the net and we screamed once more. This time, The Kid celebrated down below…snap, snap, snap. Chelsea 4 QPR 0 and only 25 minutes had been played. The drizzle gave way to periods of sun…this was proving to be a lovely, lovely day. At half-time, Neil Barnett paraded ex-Chelsea and Aston Villa player Kenny Swain to the four stands. Swain and I share something very special. On Saturday 16 march 1974, Ken Swain made his Chelsea debut as a substitute in the Newcastle United game. On that spring day over 38 years ago, I made my debut too. Swain was a good player for us, often playing upfront alongside Steve Finnieston in the 1976-1977 promotion campaign. He was latterly used at right back by Aston Villa, where he won back-to-back League Championship and European Cup medals. By the West Stand, Neil asked for all spectators to sit down and I wondered “where’s he going with this…” He announced that a Chelsea fan called Daniella from Ireland was on her hen party, dressed in a bridal gown, and asked her to stand up to receive some applause. She not only received some applause, but some choruses of “Celery” too. In the second-half, it was just a party. A further Torres goal was the icing on Daniella’s Wedding Cake. A fantastic ball from Mata was played into space and Torres nimbly timed his run to beat the offside trap. His slow and studied finish was a classic Torres goal and reminded me so much of his many strikes in Liverpool red. His celebrations took him on a run down past the inhabitants of Parky Land in the south-west corner. Frank came in for a little stick as he took a succession of second-half corners, but he just seemed to be laughing. QPR tried to annoy him by suggesting that Christine Bleakley exhibited equine characteristics. What a load of pony. The appearance as substitute of Sam Hutchinson provided another good news story on an enjoyable day in the Chelsea story of this season. The last Chelsea goal was pummelled home by Florent Malouda. Cisse – he of the ridiculous hair cut – nabbed a consolation goal and we even sarcastically applauded it. Another Chelsea win, another three goals for Fernando Torres, another Blue Day. Next Up : Newcastle on Wednesday, Liverpool on Saturday, Liverpool on Wednesday, Blackburn on Saturday, Bayern on Saturday…five games to go. The end is in sight, but let’s relish these moments. I know I said all of these things two years ago, but these really are the times of our life. Let’s enjoy every minute of them. This entry was posted in Season 2011-2012. and tagged 2011-2012, Fernando Torres, John Terry, Kenny Swain, Queens Park Rangers, Sam Hutchinson by Chris Axon. Bookmark the permalink.